Welcome to our hotel home in Florence, an innovative boutique hotel in the heart of Florence, close to Palazzo Pitti, immersed in the fascinating atmosphere of the Santo Spirito district. This was (and is) our home, here we grew up enhancing the traditional Italian habit of welcoming friends and guests. Inside this hotel you will feel at home, lulled by an artistic context where the past meets the refined present. How many people (and stories) lived in this boutique hotel across the centuries? We can try to imagine the early Renaissance in Florence, in the XV century, wondering about the endless series of legends and anecdotes about ladies and knights. Our purpose is to celebrate the ancient origins of this buildings, highlighting its characteristics with modern colors and design, looking for a harmonic mix between contemporary comforts and old furniture. Most of the works of art you will find on display inside your room and in all the common areas, are on sale. Our mission is to give the possibility to collect the emotions of a charming journey made of masterpieces and captivating glimpses, making them shine also once back home. The large windows overlook the center of Florence, watch the Florentine life flowing under your eyes: typical inhabitants and hipsters, tourists and young students. It’s your time: open the door and lose yourself in the narrow streets of the Oltrarno neighborhood, the “rive gauche” of the Arno river, the most authentic and romantic place in Florence. Eleonora, the owner, can recommend the best places to have lunch or dinner (just as the top boutiques) and Roberta (together with all the highly selected staff) will do the same. They will be at your disposal for any needs: we are ready to organize a tailor-made stay for each guest. Book now your dream, live your passionate and sensual experiences in Tuscany, reserve now your bedroom in our home and boutique hotel in Florence and fall in love with the coolest location in the world. 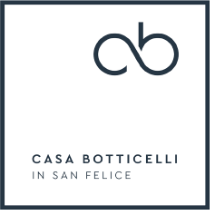 Casa Botticelli, emotions’ gallery, the art of hospitality. Discover your precious room in Florence, enjoy your double one or the fascinating “room with a view”: just looking out from your windows you will unveil the secret beauty of the Florentine life, enclosed in an evocating glimpse. Our home, just like a boutique hotel in Florence centre, a noble ancient residence in the heart of the Santo Spirito’s district. Casa Botticelli represents Tuscany seen and lived with the eyes of those born and grew up, exactly here. Explore the streets of Santo Spirito, among artisans’ shops, small pubs and trendy bars where you can sip an excellent aperitif and morning markets. Experience the magic atmosphere of the Oltrarno district, where you can live as a Florentine, between hipsters and "historical" inhabitants, students and tourists.